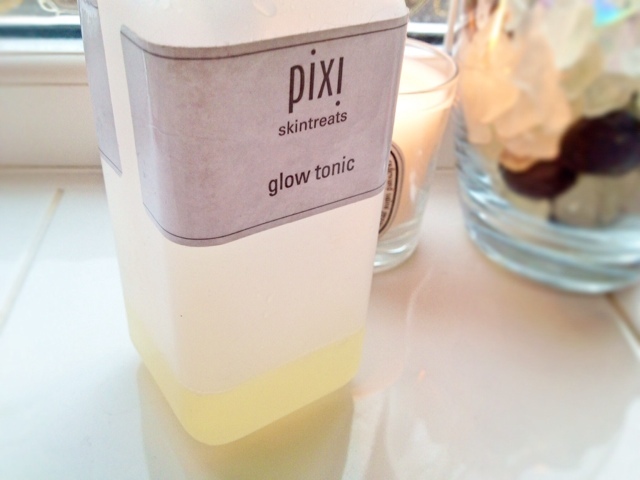 If you've clicked on this then you're probably already aware of the Pixi Glow Tonic cult status. The "wonder" exfoliating tonic that removes dead skin cells and offers a brighter looking complexion. "Glow tonic with ginseng & fructose For normal to dry, dull and aging skin. Oxygenating, exfoliating facial glow tonic. Helps tone, firm and tighten the skin. Removes dead skin cells for healthier looking skin. Use after cleanser on cotton pad. Key ingredients: aloe vera and ginseng." If you read my blog you will already know that I'm in love with Alpha H Liquid Gold. A chemical exfoliant which contains Glycolic Acid, restoring skin back to it's youthful and glowing state. I have seen some fantastic results with this so far and thought maybe I should try this out and see how I get on. The Glow Tonic contains 5% glycolic acid as well as Deionized water, Aloe Vera, Witch Hazel, Horse Chestnut Extracts and is alcohol free. The tonic is aimed at people with dry, dull skin. Mine being combination and far from dry, I gave it a go anyway. After the first use I couldn't believe how smooth and soft my skin felt. I was amazed that a potion in the most simplest, almost boring of packaging was so effective. It left my skin on my cheeks and nose super soft and smooth, feeling clean and less congested. The tonic didn't dry out my skin or leave it feeling dehydrated, but left it in perfect condition to place my serums and moisturisers on. I use it every day, morning and night as part on my skincare routine and would definitely think about re purchasing it as I am nearly running out! Part of me wants to try the Clarins Gentle Exfoliator Brightening Toner to use how it compares, so I might give that a go next, I'm not too sure. What are your thought on Pixi Glow Tonic? Do you love it or hate it? Have you tried the Clarins version, how does it compare? I really hope I can pick this up when I come to London in June!!! I'm so jealous I've wanted to get my hands on this for ages! It's a toss up between this and the Clarins Exfoliating Toner, but now this is available online I think I may have to opt for this one! Eeeeek!